Audi's flagship full-size sedan sails into 2014 with that long-awaited 36-mpg-highway turbodiesel and just a short powder-room visit to freshen up its face. Sporting all-LED lights, new bumpers and a new grille for 2014, this A8 is otherwise imperceptibly different from last year's—unless you're a stickler for interior details and infotainment software. Oh yeah, and a powerful turbodiesel engine good for 60 mph in 6.4 seconds with 24 miles to every gallon in the city. Without a single thing left to prove, given its awards for the most appealing and best-performing premium full-size in 2012, the A8 moves to solidify its position for 2014 rather than rocking the boat. For example, in spite of the new-for-2013 V6 engine affording very similar power, drivers still prefer the V8 far and away for its “beastly” performance. So Audi decided to keep the V8 after all, but if that's not enough power, a W12 engine is also still available to sate even the most fiery speed demon. However, if power and economy are both tops on your list, the new-for-2014 240-hp and 406-lb-ft/torque 3-liter turbocharged TDI is sure to please with a decidedly silken approach to clean diesel motoring. Whatever the powerplant, an 8-speed shiftable automatic, Start/Stop technology and Quattro all-wheel drive are obligatory and perform just as you would expect of Audi. Coming in at 18 mpg city/28 highway, the supercharged 3-liter V6 powering the 3.0T and 3.0T long wheelbase (L) was the most fuel efficient option until 2014, but it was a second slower to 60 mph with the optional Sport Plus trimmings than a V8-powered 4.0T or 4.0T L unmodified. Given the supercharged V6 puts out 333 hp and 325 lb-ft of torque against the turbocharged V8's 420 hp and 444 lb-ft of torque for just 1 mpg better in the city (or 16/26 as an A8 4.0T L), it's no wonder the V8 wins out more often than not with a sweet 4.2 seconds to legal highway speed. The W12 is a 6.3-liter behemoth good for 500 hp and and 463 lb-ft of torque, all the while fetching a still-competitive 13/21 but, like the TDI, it's available only in an L, where it takes 4.4 seconds to get to 60 mph. The TDI is apparently the slowest on paper, but early drivers note you won't notice much difference between the V8 and this diesel V6 if the extended wheelbase is the apple of your eye. Standard features didn't change between 2013 and 2014, but highlights include adaptive headlights, automatic climate control, leather seats, a power-adjustable steering wheel, power sunroof, power trunk, keyless entry/ignition, rear-view camera and a navigation system complete with Audi Connect and a premium sound system. Option packages across the entire lineup maintain the same Premium, Premium Plus and Prestige layout any Audi driver would recognize instantly, but for those unfamiliar, you would only need to upgrade to the Premium Plus for 22-way powered front seats with massage functions among features like Pre-Sense Rear, Side Assist and several other endlessly useful features to keep your A8's new lines crisp. What's your take on the 2014 Audi A8? 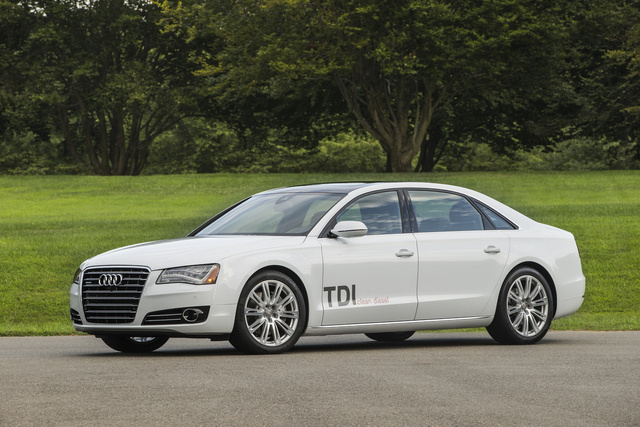 Users ranked 2014 Audi A8 against other cars which they drove/owned. Each ranking was based on 9 categories. Here is the summary of top rankings. 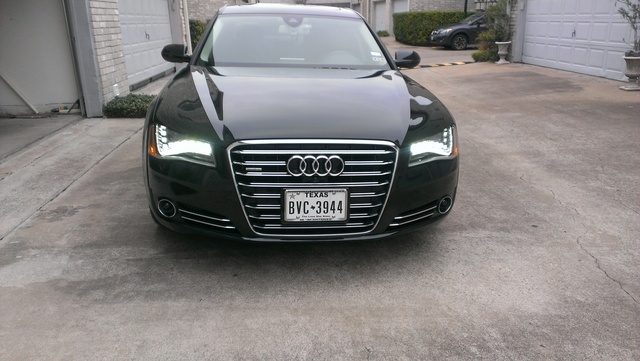 Have you driven a 2014 Audi A8?